Do you believe in Mermaids? Mermaids, otherwise known as 'Angels of the Sea', are fascinating legendary beings. Mermaids and sirens were feared as much as admired. These creatures represented the deep unconscious (as does the sea), bringing up fears of diving deep into the unknown, of change, of losing control, or of leaving behind what was once known. This pendant is made for those who resonate with the water energy and with it's infinite power. It is one of a kind piece, made with the intention to protect your environment from harmful emf frequencies & negativity, to help in decision making and to provide clarity to the mind. 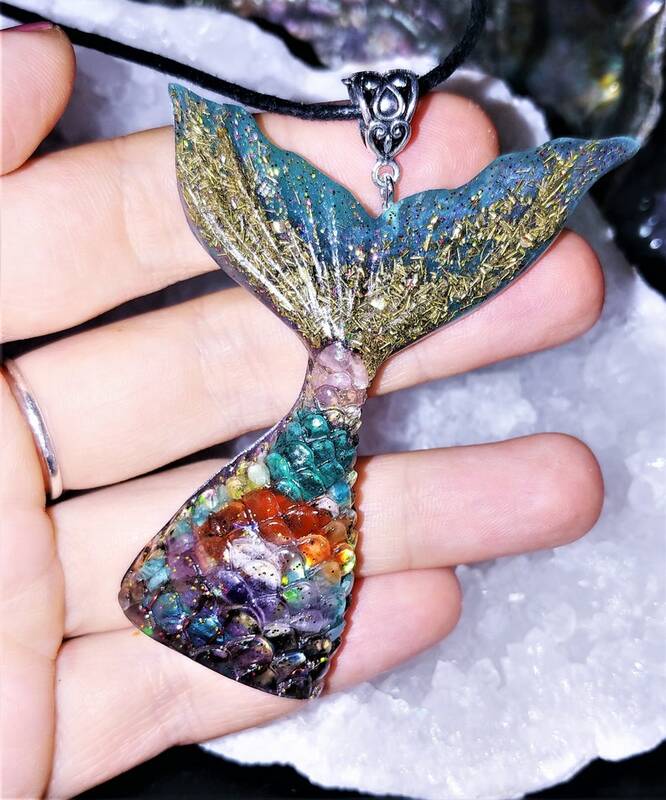 This Orgone pendant comes with FREE Necklace (18"). It contains Rainbow Aura Quartz wrapped in copper wire, Rhodochrosite, Amethyst, Amazonite, Carnelian, Malachite, Shungite powder, Pyrite, mica, 24 k gold leaf, tesla coil, metal shavings, jewelry grade epoxy resin, Black Sun Iron Oxide nano powder, Love and Light, 528 Hz frequency, Reiki energy. SHUNGITE is known for shielding and protection from EMF electromagnetic radiation from things like TVs, computers, microwaves, cell phones, and other items. This shielding brings with it many healing energies. Shungite is an excellent stone for magickal and mystical work. It grounds spiritual energy to bring it into the Earth plane existence. Shungite is also used to bring Light into the auric energy field, allowing positive energy only to reach within that field. This brings not only physical protection, but also psychic protection. It is said to be protection against the evil eye and negative energies.